Turmeric – Bring it back this Winter! Personally, I think turmeric is one of the most versatile spices in the cupboard. Ground turmeric powder, which most of us have in our homes, is made from taking the rhizomes (the stem/ root) of the turmeric plant, boiling them for 45 minutes then drying in a very hot oven until they are able to be ground up into that familiar sunshine orange powder. The turmeric plant is part of the ginger family. Turmeric From The Market. Varkala, Kerala. Before it was used for culinary purposes it was used as a dye and medicinally in Ayurvedic treatments. Research found that it has ‘been used medicinally for over 4,500 years. I came across this when I was first working in India. I came into the kitchen with a terrible cold one morning and one of the Indian chefs insisted that I drunk his concoction that he made in a saucepan three times a day. He boiled water together with a few tablespoons of turmeric and a handful of basil leaves. It was really quite a disgusting drink but under strict instruction I continued his prescription. Anyway, I think it worked – try it for yourself this winter. Turmeric is said to be anti-inflammatory, anti-tumour, anti-bacterial and anti-viral! Turmeric on The Beach. Varkala, Kerala. In cooking, turmeric is used for flavour and also preserving. When preparing fish for Indian dishes you often start with marinating the fish in salt and turmeric before keeping it in the fridge overnight. It makes fish last so much longer and gives it a beautiful colour. It also protects fish from sunlight. Indians tend to add turmeric to almost anything that they think needs to be bright orange. If in doubt chuck some more in! – I’ve found turmeric on the labels of sports drinks, biscuits and ice cream. Pakoras are a delicious Indian deep fried hot appetiser. Vegetables are dipped in a batter of corn flour, flour, water and turmeric. When deep-fried these little bundles of pieces of vegetables are bright orange. They are served with either a peanut dipping sauce or coriander chutney. I think they are great with tzatziki. I’ll put up a recipe for some mixed vegetable ones shorty. For a beautiful addition to your meat and two veg dinner (if that’s on the menu) –toss together small florets of cauliflower with some vegetable oil, salt, cumin seeds and turmeric. They will brighten up any dish scattered around the plate. Spices In The Market. Varkala, Kerala. Fun Fact – 1 tablespoon of turmeric is 24 calories! – Who’s counting! It’s rich in fibre, iron, potassium and magnesium and perfect to boost immunity in the winter months. This is because of the main ingredient, curcumin. Although not the easiest to find in the UK, raw turmeric root can be eaten raw, chopped up finely in salads. It adds a peppery flavour. Anyway, as the coldness creeps in why not try and add some turmeric into your diet. It’s been keeping India full of sunshine since 2500 BCE! Coconut Oil – Why’s everyone so nuts about it? In England you can’t go anywhere without hearing about coconut oil. We’re told to cook with it, put it in our hair, on our skin, and to drink it! It’s used a lot in health / vegan recipes as a binder when ingredients such as butter or egg have had to be admitted. It’s also seen as a healthier alternative to most cooking oils for pan-frying, especially as it has a high smoke point making it perfect for stir-fries. It has become quite the fad with health food cooks and eaters, however the main problem is that this is not a cheap ingredient in the UK. Coconut oil, once overlooked in the supermarket, has now had its price tag multiplied. 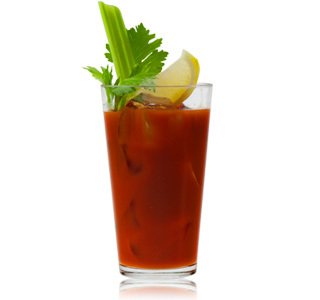 It’s now sold as a ‘new’ health product with implications that it’s going to change your life! The Coconut Boss. Varkala, Kerala. Personally I am quite sold on it. Slightly behind, I first discovered it while being massaged with it two years ago in India. I started using it as moisturiser while living there. Famously Indian women use it to keep their plait of shiny black hair looking so luscious. Over there, this product is being sold in 1 litre bottles for no more than a pound, this same amount sold in two smaller pots is an extortionate £30 at Holland and Barratt and probably more at Whole Foods! 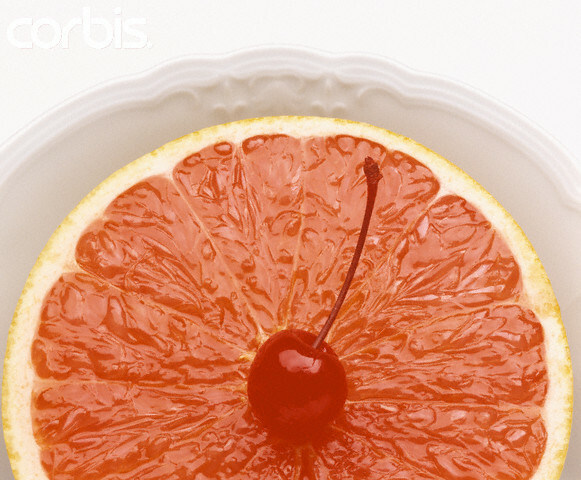 Everyones going crazy for it – a friend of mine gargles it in around her mouth for 10 minutes a day, she ensures me it will make her teeth whiter! You can only afford that if you live in India (it’s also really unpleasant to do). Also – fun fact – when used as sunbathing oil it apparently has a natural SPF of 6 – super handy!? There are claims it’s good for heart disease, seizures and promotes weight loss etc. Don’t mess with the coconut man. Varkala, Kerala. To cook with – As a really simple way of bringing coconut oil into your diet I would recommend using it firstly, when roasting any vegetables for a more interesting flavour. I once had kale roasted in the oven in coconut oil with sesame seeds until crisp, then finished off with cooked brown rice and soy – delicious. Secondly, try it as an alternative to butter in baking – I have tried with great success. Thirdly, try using it instead of your normal veg oil. You can get coconut oil with reduced flavour so that your dish isn’t smothered by it! Using it with apple cider as a natural treatment for lice – which works apparently. By itself as a natural deodorant – not sure about that one! Evidence suggests that regular ingestion of coconut oil can help prevent or reverse Alzheimer’s. As a natural lubricant that won’t disturb ‘vaginal flora’ – I’ll let you be the judge of that! It can be rubbed on the scalp to stimulate hair growth. Anyway, give it a go and let me know how it goes (if you can afford it in England)! Behind the coconut stall – A hard days work! For the following weeks I am going to be researching the history of food in India. I want to look at the vast scope of diets across India, often to do with availability and / or religion. For instance, in the religious faith of Hinduism the cow is worshipped and therefore beef is strictly prohibited. High up in the north of India in Muslim states, such as Srinagar, pork isn’t available. In the south of India, where the majority of the people are Christians, beef and pork are on the menu. The ingredient found in the south that I am particularly fascinated by is the Goan sausage. Some could call it an early ‘food fusion’ between India and Portugal (before it was a la mode!) The Portuguese arrived on India’s West coast in 1498. Many ingredients were introduced into India in the holds of Portuguese ships such as chillies, coriander, potatoes, tomatoes, cashews, aubergines, and pumpkins. 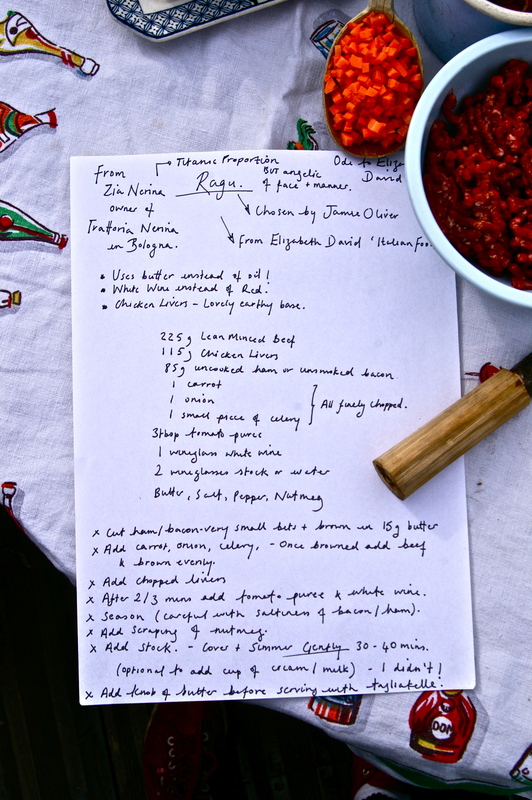 Inspired by chorizo, Goan sausage was welcomed on the Christian Goan shores. Cured sausages were perfect, at this time, as they could keep for up to 6 months. This was ideal for the sailors on the trade routes at sea. During the monsoon, when fish were harder to come by, pork offered an alternative source of protein. I have tried a different type of Goan sausage dish every day whilst being here for the last four days. 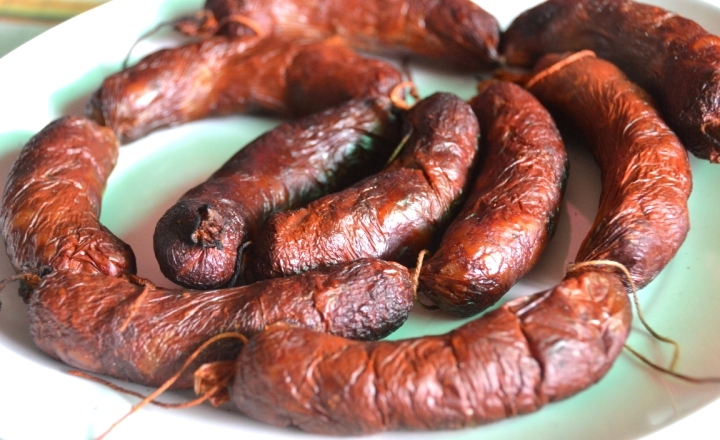 The Goan sausage is best described as being similar to the Portuguese chorizo. Goan Sausage Pao – Crumbled Goan sausage, in a burger-type bun with sweet sliced red onions. Perhaps more suited for a night snack after a few Kingfisher beers. Goan Sausage Pulao – Fried rice with small pieces of Goan sausage mixed through with whole cardamom pods, cinnamon sticks, star anise and bay leaves. A heady mixture of strong spices that sung out, enhancing the plain rice and matching the strong flavour of the sausage. The huge mound of it that arrived at the table was devoured instantly. Goan Pork Sausage Chilli Fry – A stir-fry with potatoes, red onions and green chillies. Perhaps eaten with a chapati or naan bread. The chunks of potato were cooked so that they still had some bite. The potatoes had turned a golden orange because of the juices released from the sausage whilst frying. Goan Sausage Pizza- What is says on the tin! Deliciously prepared in a wood fired oven, the mixture of mozzarella and crumbled sausage was the perfect combination. I have found one recipe online which teaches you how to make and cure your own Goan sausage over four days, which I have put below. However from experience, if you want to buy them to use as an ingredient, the link below offers very high quality products. The pork used must be fatty. Wash it well and drain the pieces of pork. Fill the sausage casings with the pork mix using a funnel and a cutlery knife to push the meat down. Tie the casings at each end. I worked at the fantastic Indian small plate and cocktail bar restaurant called Kricket this year. The inspirational head chef there, Will Bowlby, used Goan sausage in one of the lunch favourites. This is one of the dishes I learnt to make. 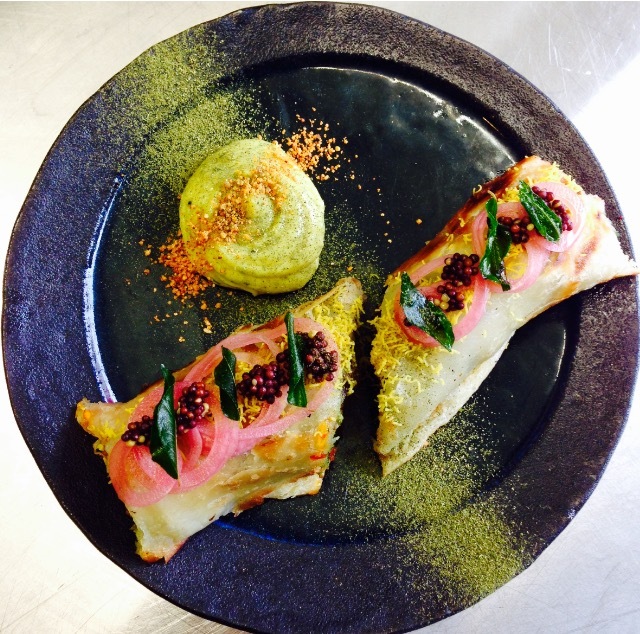 Goan Sausage Roll with Pachadi Mayo, Pickled Red Onion and Mustard Seeds. In an article in the Guardian in 2013, chefs such as Jamie Oliver and Prue Leith were asked to choose their favourite Elizabeth David recipe and explain why they thought it was so special. Leith chose David’s instructions on poaching eggs. She said that ‘there are a lot of myths about poaching eggs but this tip I had never heard. She recommends you to submerge the whole egg in its shell in boiling water for 30 seconds before fetching fresh boiling water and continuing with the usual drop of vinegar and swirl technique when poaching the egg’. Apparently this helps the egg, once out of its shell, to keep its shape. I am definitely going to try it! 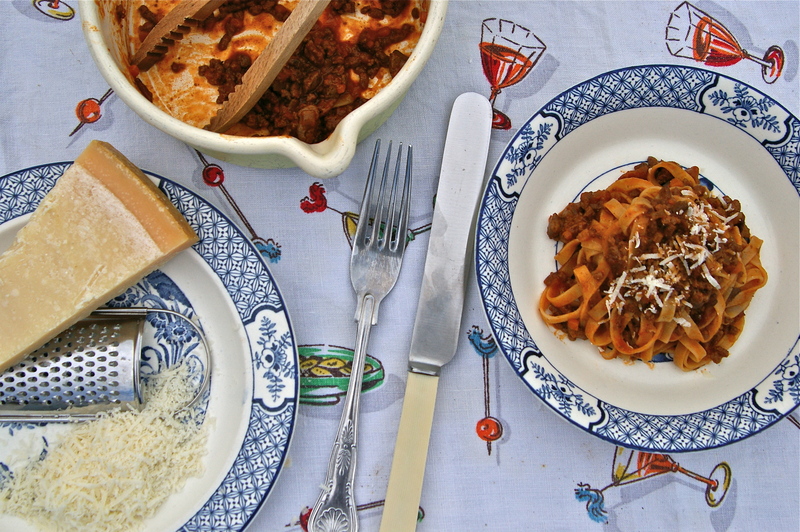 Jamie Oliver chose a recipe for a ragu from “Italian Food” by Elizabeth David. This is a very special recipe that was cooked in the 1950’s by Zia Nerina (owner of Trattoria Nerina in Bologna), in the 1960’s by Elizabeth David, in 2013 by Jamie Oliver and now in 2015 by me. Today I listed down the small list of ingredients and headed to the butcher for some livers! 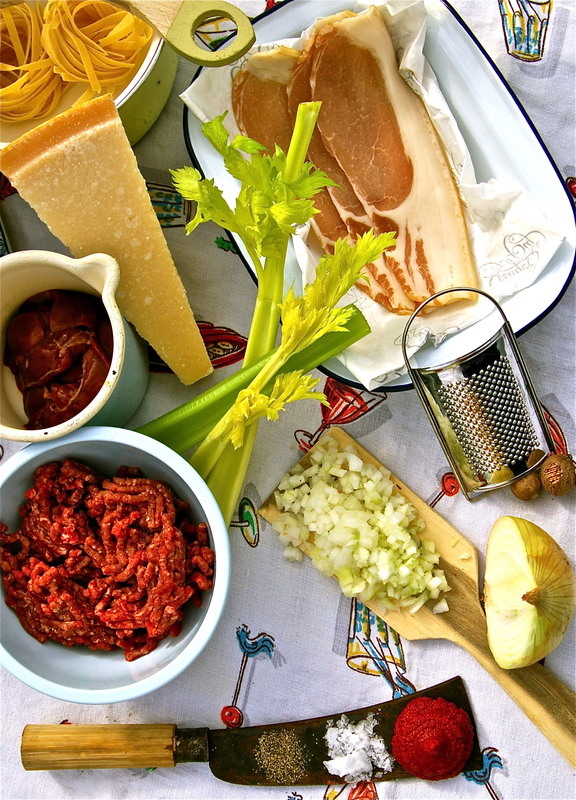 What interested me about this recipe for ragu is that instead of finding the traditional ingredients such as olive oil, garlic and red wine they are replaced with chicken livers, butter and white wine. I was sceptical at first, as was my Dad who kept asking me to decrease the amount of livers (haunted by calves liver at school) if he was going to try it. Anyway, I stuck exactly to the recipe and all I can say is that I’m never going to go back. It was buttery, meaty and marvellous. I couldn’t get hold of any uncooked ham so I used un-smoked back bacon. I did find I had to reduce it for a good hour without the lid on to get the thick ragu I desired instead of grey meat in a watery sauce. The end result really was fantastic and has further increased my adoration of Elizabeth David. If it’s a surprise to me to taste such a delicious ragu sauce in 2015, I can only imagine what it must have been like for her in 1960. This is the true name of the Bolognese sauce which, in one form or another, has travelled round the world. In Bologna it is served mainly with lasagne verdi, but it can go with many other kinds of pasta. 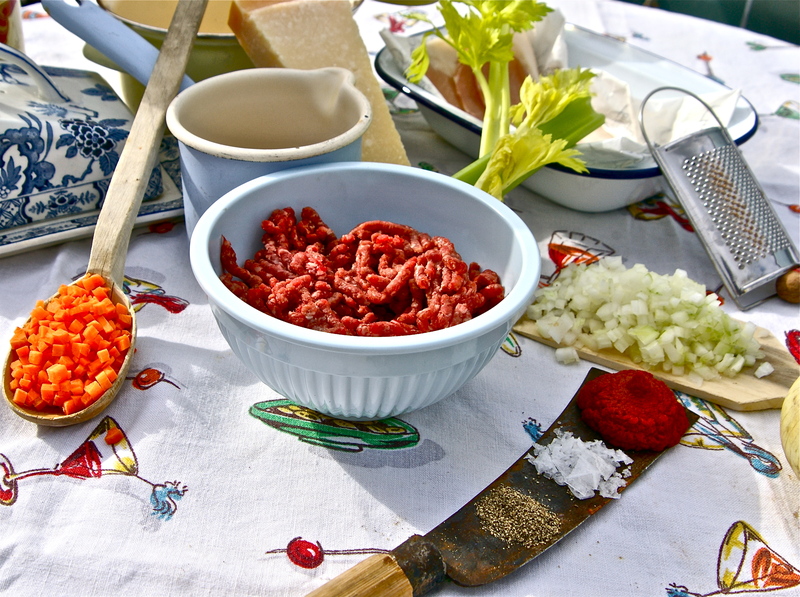 The ingredients to make enough sauce for six generous helpings are 225g lean minced beef, 115g of chicken livers, 85g of uncooked ham, both fat and lean, 1 carrot, 1 onion, 1 small piece of celery, 3 tablespoonfuls of concentrated tomato purée, 1 wineglassful of white wine, 2 wine-glassfuls of stock or water, butter, salt and pepper, nutmeg. 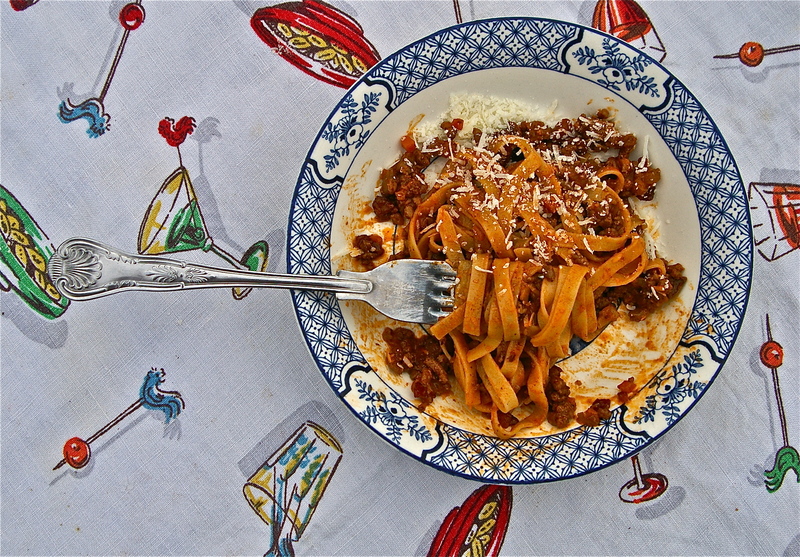 When the ragu is to be served with spaghetti or tagliatelle, mix it with the hot pasta in a heated dish so that the pasta is thoroughly impregnated with the sauce, and add a good piece of butter before serving. Hand around the grated cheese separately. I have recently acquired a 1964 edition of Elizabeth David’s “French Provincial Cooking”. It welcomingly smells of an old library and has a charming inscription which reads, “To Marion, Not so much a cookery book, more a tradition in eating, un manuel de bons plats de ma chere France. Bien amicalement, Rolande, 1964.” This translated is “A Handbook of Good Food of my Dear France”. And this is exactly what I found while leafing through the pages. Elizabeth David is a heroine of mine as, in my mind, she began the adoration of mediterranean ingredients in England. I am doubltful that she single handedly achieved this, however publishing her book ‘A Book Of Meditarranean Food’ in 1950, just as rationing was finally coming to a close, successfully filled food enthusiasts with great delight. Butter, cheese, margarine, cooking fats and meat did not come off the ration until 1954 and so recipes with ingredients from abroad were exciting and full of hope for the future at this time. Post WWII everyone was craving something a little more exotic. At last, food enthusiasts could experiment with flavours and recipes after suffering on beige diets of bread, lard and potatoes. From reading obituaries and articles about Elizabeth David’s life, she sounds like she enjoyed a few bottles of Chablis regularly and got what she wanted. She spent the war on a sailing boat with a lover ending up in Egypt before eventually marrying Anthony David, a relationship which was apparently ‘doomed from the start’. This may explain why she was someone who chose to cook, as being born into a wealthy household she had a full team of staff in the house that would have provided all of the family meals. But, perhaps the British palate now bored her after trying ingredients from overseas. She cooked the food she missed from her times abroad during the war and then started writing fondly and descriptively, educating England on the flavours of the Mediterranean and France. This well known saying stems from the book on stereotypes about masculinity, ‘Real Men Don’t Eat Quiche’, by Bruce Feirstein, published in 1982. I do sort of get it – if I saw the hunkiest of men standing at the other side of the buffet table and I walked up to him while he was delicately forking his way through a slice of quiche I may think again! When I think of quiche I think of bits of it squashed in a lunch box or picnic hamper or a large one sweating on a buffet table. 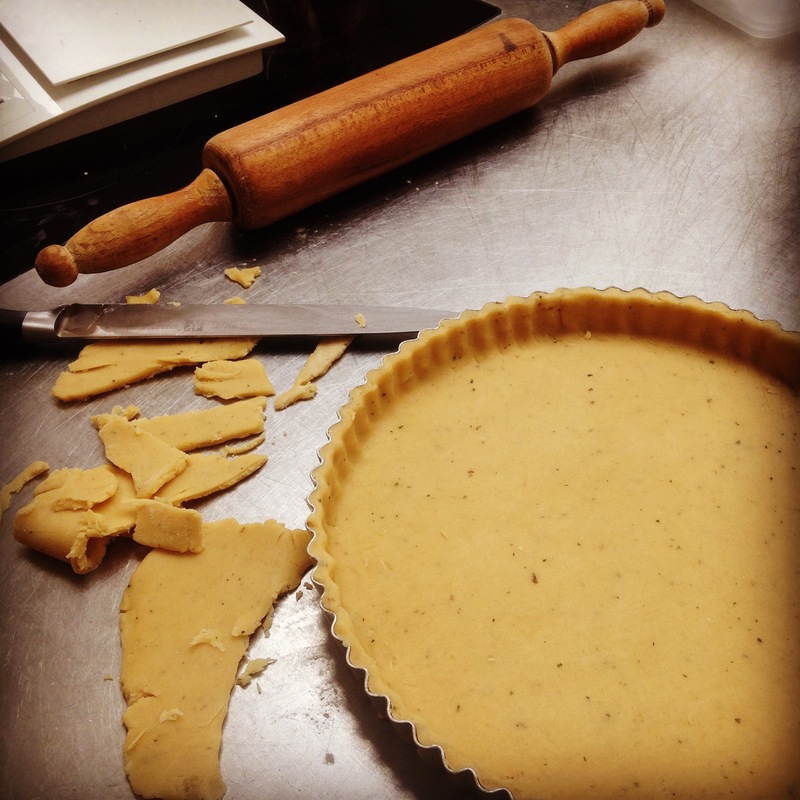 My memories of it at cookery school are of dread – short crust pastry and egg cooking. There is no way of hiding a badly blind baked tart mould or a souffleing centre. Bad quiche has got to be the most terrible thing known to man. The cheap ones you can buy for pennies in supermarkets are all one shade of beige and its seems as if they have gelatine in them. However, you can now get fancy quiches – 8cm in diameter and about £5 a slice from a posh Notting Hill delicatessen. Anyway, I now am a big fan of the quiche and here is why. You can have it hot or cold, veg or non veg, and everyone will try one slice at least (even the real men). You can have it in summer or winter and it’s good for all ages etc. etc. Basically I’ve now decided it’s fantastic! 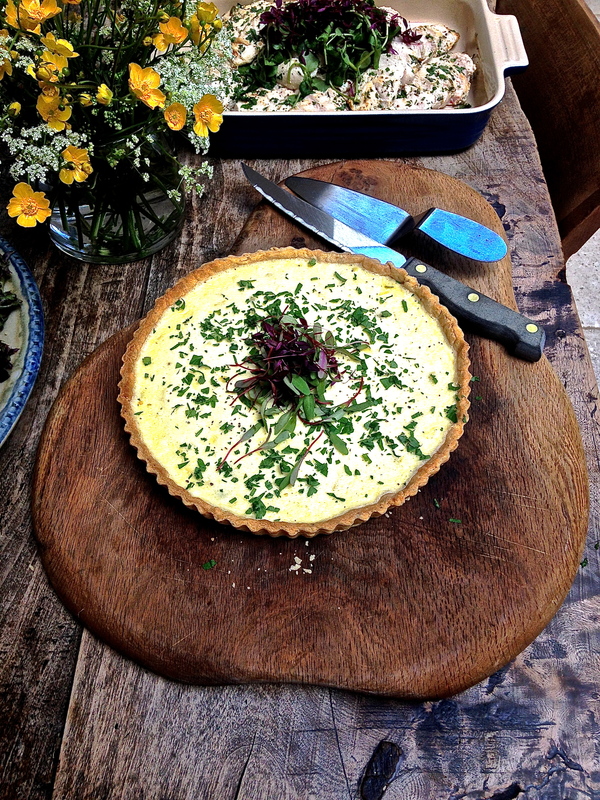 At the end of the day I think life is too short – if you want cheese in your quiche – you go for it! HERB QUICHE (WITH CHEESE) WITH THYME AND PARMESAN SHORT CRUST PASTRY. Sift the flour and salt into the bowl of the blender, and add the parmesan and thyme. Cut the chilled butter into cubes. Add the butter to the four. Pulse the blender until the butter and flour resembles breadcrumbs. Add a tablespoon of the liquid mix to the breadcrumb mixture and start the blender. Slowly add a few tablespoons of the liquid mix at a time until the dough comes together as a whole. Tip the pastry onto clingfilm, wrap and put in the fridge for half an hour. Recently I have discovered mead, which is an almost forgotten alcoholic drink made from fermented honey and water. It can be a little sweet and too rich for me but actually I was lucky enough to try some dry mead recently, which was absolutely delicious. I cooked for a ‘Bee Weekend’ hosted by the fantastic magazine The Idler last month where bee and honey enthusiasts spent the weekend learning about bee keeping and discussing all things honey. For dinner on Saturday night I made a honey banquette using delicious honey which came in a huge bucket! It’s lovely that honey from different parts of England, and obviously the world, have completely different tastes. The honey I was using had come from the coast so the bees there had taken pollen from plants that are covered in salt and can survive the harsh winds. I also tried some urban honey that had been made in hives on the roof of a house in West London. They definitely had their own unique flavours. Honey has been around for an very long time. According to the Honey Association “cave paintings in Spain from 7000BC show the earliest records of beekeeping, however, fossils of honey bees date back about 150 million years.” Furthermore “the earliest record of keeping bees in hives was found in the sun temple erected in 2400BC near Cairo. The bee featured frequently in Egyptian hieroglyphs and, being favoured by the pharaohs, often symbolised royalty.” The Romans and the Greeks were both fond of using honey in their cooking. They used it as a sweetener as well as using it to make cakes as an offering to the gods. Mead can be traced back to nearly 40,000 years ago. Unfortunately it’s not readily available these days. I had to go to Jerry’s Liquor Shop in Soho to buy a bottle. Other than that you can get it online. I was very proud of my bottle of mead and carried it in my hand on the train journey to Gloucestershire for the Bee Weekend. 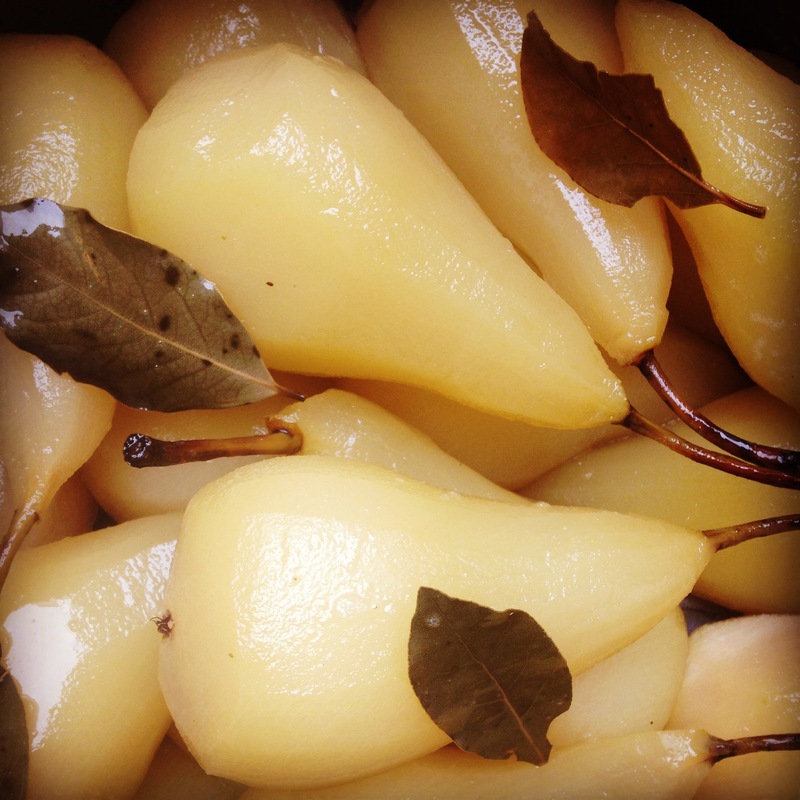 I needed it specifically for a pudding that I was planning to cook; Pears Poached in Mead. Put the pears in a large cooking pot, lay each one flat on one side and pour in your prize bottle of mead. You want the liquid to come half-way up the pears. If it needs topping up do so with water. Add a few bay leaves and a few tablespoons of honey and simmer on a low heat. After 30/45 mins feel the side of the pear that has been submerged in the mead. When it is soft to the touch turn the pears over and cook them on the other side for the same amount of time. Once the pears are soft through remove them onto a dish and keep warm. Return the liquid to the heat and reduce until syrupy. To serve: put one pear in a bowl with a few tablespoons of the mead syrup. I served it with some vanilla ice cream and an edible flower (after all there wouldn’t be any mead if it wasn’t for the pollen from the flower!). Now I have been looking out for it I have noticed that a few pubs in the countryside are serving mead as a speciality drink. Hopefully we are experiencing a renaissance in mead, as it is both delicious and a great cooking ingredient.